Nik Constantinou has a dream. He wants to be a punter in American football, and is well on the road to that dream. We see a great deal written about the journey other “cross coders” have made in leaving their homes overseas to try their hand at Australian Rules football after having played a range of sports including Gaelic Football, soccer, basketball and many more. We have also read about the drive to do so and the reasons behind the attraction. 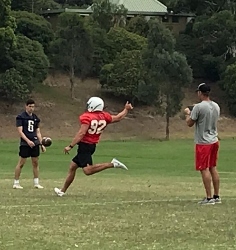 But we rarely, by comparison, read about the motivation of Australians who do the reverse: leave behind a life in Australian Rules football to go to the United States of America to give punting a go in American Football (Gridiron – maybe NFL). Nik has shared some of his insights into a journey he has commenced to chase a relatively new dream – but a dream just the same. The AFL Tribunal will sit tomorrow night, Tuesday April 2 5pm (Melbourne local time), to hear the charge laid against Collingwood’s Mason Cox. Mason Cox, was charged with engaging in Rough Conduct against Dylan Grimes, Richmond during the fourth quarter of the Round Two match between Richmond and Collingwood, played at the MCG on Thursday night March 28, 2019. It is slow and gradual, but it is relentless. More and more Hollywood and entertainment heavyweights are taking our great game to a world stage, perhaps nowhere more so that the United States. In the past twelve months, a slew of Hollywood (or entertainment general) figures have visited Australia and ensured they spent time learning more about our game. Last night, as part of the first AFL premiership match at the newly renamed Marvel Stadium, Chris Hemsworth (Thor) and Matt Damon (remember his small role as Loki in Thor: Ragnorak) cheered on the Thor-themed Western Bulldogs. Last year both Meghan Markle and Natalie Portman surprised the Australian Rules football world with surprise visits to clubs or related events whilst in Australia. Now, American comedian Conan O'Brien is the latest celebrity to spend time learning our game - with the Sydney Swans. The following YouTube clip shows O'Brien learning the game as part of a new show in production. Just last week the Hawai’i Eagles held a small inner club match. 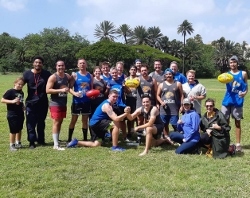 The grey team defeated the blue team on a cold, wet and windy – almost Melbourne like day – in what the club thinks may be the first ever Australian Rules game played in Hawai’i. However, the bigger picture is the club’s inclusion within the USAFL – to date the biggest vindication of their efforts and acknowledgement of their presence on the North American footy scene. To mark that event, Brian Barrish from the USAFL wrote the following article for the www.usafl.com website. Dallas McCulloch arrived in Honolulu with a bit of an itch to scratch. He had played Aussie Rules for the Austin Crows before heading to Australia, where he spent four months playing for the North Brunswick Bulls of the VAFA. Well, sort of. Last year, the Hawaiian sports scene was expanded to include a new Australian football club (see:Australian Rules Football Comes To Hawaii). 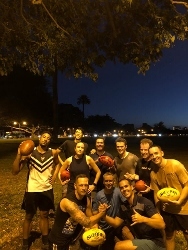 Since then, men and women have been meeting at Kapiolani Park in Waikiki to have a kick, develop skills and enjoy the social side of a footy team. But now the club has taken the step to officially brand itself. 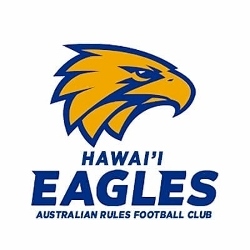 They have now called themselves the Hawai’I Eagles Australian Rules Football Club. 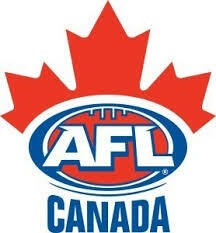 Not to long ago AFL Canada released a pictorial summary, displayed at the end of this article. Now we have presidents report from AFL Canada which provides some explanation. In summary, senior player numbers were flat . AFL Ontario contributed to the lower number of men's player with the withdrawl of Broadview in Toronto bringimg the men's division down to nine teams, but with new prospects in in the regional cities of Barrie, London and especially Kingston. AFL Quebec increased in both genders, with the introduction of the Montreal City Blues and Blue Belles bringing the league's teams up to five and three, respectively. Juniors league players are split between the long established North Delta Junior AFL and Calgary. The vast majority of those junior players are non-Australians. Hollywood actor, Natalie Portman, has recently visited Australia and spent some time with the Melbourne Demons. On her return home, Natalie has taken our game to the world stage with a brief mention on The Ellen DeGeneres Show, taking the "platypus" of sports into homes across the United States and the world. Last week, World Footy News reported on the arrival of a new centre for Australian Rules football. Hawaii, better known for Pacific holidays, Pearl Harbour, Waikiki Beach and Kilauea, has some hardy enthusiasts getting together in Honolulu to create a new club – a club that could potentially develop like no club before it. Dallas McCulloch isn’t your average footy player. But his drive, along with a great team around him, is making positive things happen. They are onto something. Our interview with Dallas and his vision for the future makes for some very interesting reading. The prospects of a Pacific-wide Australian Rules football competition have been discussed for many years with many locations touted as potential venues. However, the arrival of Hawaii as a football destination might just add another dimension to that argument. Here is our chat with Dallas.